High on the cliff tops of Cornwall, the distant sounds of a pianoforte can be heard echoing through Ebbington Manor late at night. Emma Smallwood and her father have come to Ebbington Manor as live in tutors for Sir Giles Weston and his family. Emma and her father ran a small boarding school where the two eldest Weston boys, Henry and Phillip, attended in their youth. Emma doesn’t harbor much affection for the eldest brother, Henry. All she remembers of Henry was that he was a bully who always played pranks on her when he was at the school. As for Phillip, Emma remembers him as a kind hearted, friendly boy. When a letter arrives asking for their presence at Cornwall, Emma and her father quickly accept but Emma is worried she might run into Henry, a thought she does not relish. When they arrive at Ebbington Manor they meet the two younger Weston twins, Rowan and Julian, and a ward of Lady Weston, Lizzie. Lizzie is quick to befriend Emma, but the twins are reluctant. Emma spends her days assisting her father in the schoolroom and organizing their possessions. Then suddenly, Phillip and Henry arrive at the Manor. When Emma comes face to face with the older brothers, she finds Henry still the arrogant boy she remembers from her youth, and Phillip as amiable as ever. Soon after their arrival, mysterious things start happening in the Manor. The phantom music echoes through the halls, Emma’s items come up missing, and at night she hears someone in her room. The twin Weston boys call it a ghost….but Emma isn’t so sure….she fears something more sinister is at play. One night a letter turns up under Emma’s door professing a secret admiration….who could it be from? A Weston brother presumably….but which brother? As a young girl she was awkward and studious, a real bluestocking….could it be possible that one of the Weston’s finds himself in love with her, rather unexpectedly? Danger continues to mount while the suspicious acts escalate, unrequited love flourishes and Emma finds herself caught in the middle. I absolutely adored this book. This was not a book that I would normally pick up as it is categorized in a genre I would normally not read (Christian Fiction). I have nothing against Christian Fiction, but I have a stigma that the genre is overly ‘preachy’. However, this book totally caught my eye. The setting and story line really appealed to me so I decided to give it a go regardless of my preconceptions of the genre. I was pleasantly surprised that the novel wasn’t heavy on the religious side. There was clearly a Christian message but I didn’t feel like it distracted from the story in any way. Considering the time period, the Christian message in the book fit right in, as religion was a large part of Regency era England. I found it made the story more authentic in that regard. What I loved most was the mixture of classic story telling. 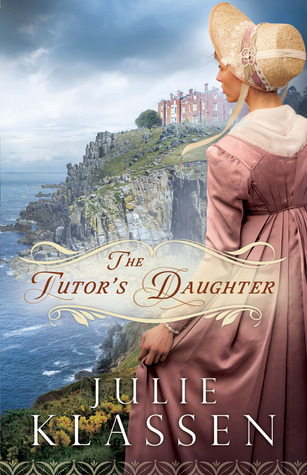 Author Julie Klassen is a self professed lover of all things “Jane”….Jane Austen, Jane Eyre etc, and I clearly felt that love in this novel. The story reminded me so much of Jane Eyre with the gothic elements of the story and the brooding lord of the manor but yet it carried hints of a Jane Austen novel as well…Northanger Abbey comes immediately to mind, but there were parts that also reminded me of Emma, Pride and Prejudice, and Sense and Sensibility. Emma was a strong female heroine but not cold, she was kind hearted and likeable but yet confident and self possessed. She had a romantic side but was practical, educated, and not silly which I loved about her. I also really enjoyed Henry’s character. He was vulnerable, kind hearted, romantic, but yet a shy brooding hero as well. A Mr Rochester meets Mr Darcy for sure! He came across as arrogant and conceded initially, but as the story went on, we got to really see him in a different light. I love when characters win me over like that. He wasn’t uncharacteristically romantic either. He had a romantic side but only showed it to people worthy of such an honor which made him more genuine and believable. The romance in the novel wasn’t over done or cheesy. In a genre where clichés are popular and over done, this plot was not. I really really loved the mixture of the Bronte/Austen styles both in plot and characters. The setting added a lot of drama and romance to the novel as well. The Christian Fiction genre is often characterized for a very target specific audience and as I said earlier, I was hesitant to pick this novel up simply because I felt like it was not something that would interest me. But I was totally won over by the characters, plot, and romance of the overall story. Do not let the stereotype discourage you, this is a charming historic fiction/romance novel that will leave you satisfied and itching to read more by Klassen! I know I am adding all of her books to my growing TBR list!